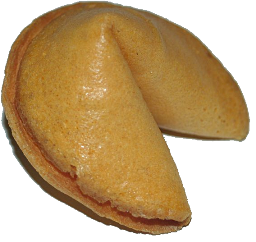 Some Times the Cookie is Good Fortune Enough! Joyful welcome to a new season! I’d want his soggy nut? Towards the end of my walk I heard the sounds of someone approaching from the rear. It was an old colleague long ago retired on his brisk daily walk. I joined him for a short distance exchanging pleasantries and news. He continued on following the parameter of the campus, I turned toward the looming brick structures, toward my office and a letter and a blog. Sometimes friendships are like memories, diminished to a faint glow, residue of an earlier time! 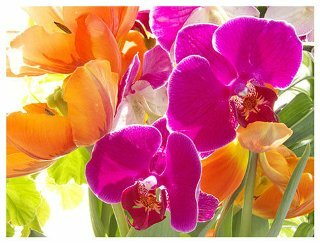 Have a wonderful day I hope you too are visited by images of Spring and words that jigsaw into poems! If you have enjoyed the blog please sign up for stationarypilgrim’s e-mail notification by going to the upper right corner of this page. A Resolution: Civic Pluralism First! What to blog on today. It is not a question of scarcity but of bountifulness. There are so many potential topics. So many spiritual and religious questions populate my Blog idea folder! Of course there is the symbolism of reaching the end of a calendar year and out with the old and in with the new. 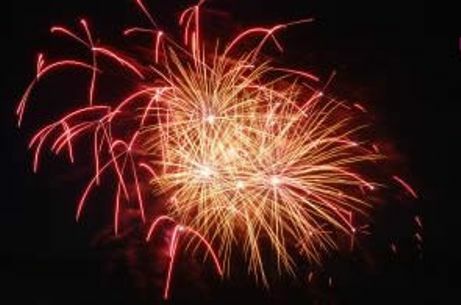 The local newspaper and many local news casts are speaking not only the best and worst of 2009, but the best and worst of a whole decade. Of course many people are busy preparing their pledges towards the future with resolutions to better their health, living space, work productivity and to renew their religious and spiritual rituals. Some might start a new journey, while others will resolve to double their efforts on their current path. 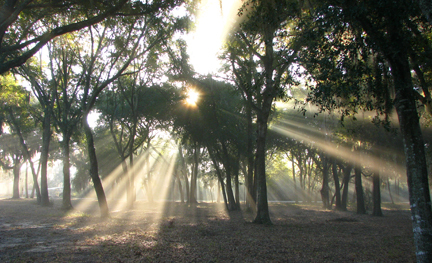 Cycles in nature and in our lives are but one of the things that give our lives meaning and some predictability. Cycles give an excuse for a “fresh start.” They give us a chance to banish mistakes and errors of “the past.” This blog has become an important part of my life as a source of inspiration, and a testament to my perseverance and progress. But it is not my whole life. I am preparing to send one son off to the military and to war. I am watching as a second son learns the ropes of having a first girlfriend. I am preparing to once again enter the classroom. Some classes will be filled with fresh faces, students who have not heard my stories and have not been challenged by my experiences and world view. Other classes will be filled with seniors, who have heard all the stories and are ready to “take off” into the real world. All I can do is tweak them a bit, add a little polish and send them on their way. My virtual bike trip has strengthened my legs and deepened my breath. But my habit of snacking has limited its impact on my girth. I resolve to cut back on my snacking and make my studio and office more of a “clutter free” zone. What about the blog? Structurally I will complete the redesign of the Pilgrimage Site page and redouble my efforts to identify such sites as we return to our virtual map. These will be only cosmetic changes. This morning a voice from my past pointed out a philosophical and theological question which I intend to explore in the months to follow. I’m always looking for resource books and research projects for my classes and now the blog. I glanced at the stack of books and one title jumped out at me. 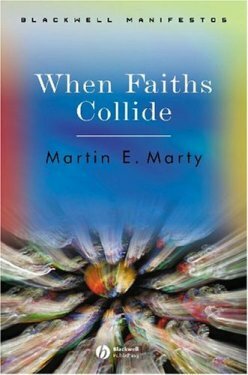 I was Martin E. Marty’s book entitled: When Faiths Collide. It was a book I picked up this summer before I had started the blog. The title intrigued me, but the author was someone I had the pleasure to meet years ago. 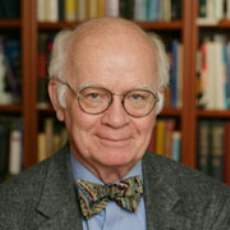 Dr. Marty is a Lutheran pastor, and a Professor Emeritus of Theology at the University of Chicago Divinity School. I met him when he was a guest speaker at my University, lecturing on the dangers of religious fundamentalism. We sat and talked for close to an hour. We discovered that we shared a common root. He was from a small farming community in eastern Nebraska, the same town where my mother had grown up. It turns out that he knew my grandfather and inquired about my uncles. It is truly a small world! As I sat at the car dealership this morning, waiting to have some repairs done, I opened his book to the chapter on pluralism. Barely a page into it I realized I had found another resolution for the New Year: to use the structure he outlined to refine my definitions of diversity and pluralism. An underlying theme of my blog has been my recognition of an interconnection of all faiths, something Dr. Marty would call a “theological pluralism.” He points out that this is not an “easy sell” as it is likely to raise defenses of more exclusionary faiths. Whereas “civic pluralism” relates to practical adjustments people make in communities in order to promote orderly relationships and common ground between different faith communities. Dr. Marty notes that civic pluralism presented us with a less daunting task to implement. This form of pluralism existed in the small towns Dr. Marty and I grew up in, on the plains where there was a necessity for town matters not to turn into battlegrounds of inter-religious warfare. I have stated in my blog that I see my efforts as a small ripple, but that when combined with others, these ripples could become a larger wave for positive change. It will be my goal in the New Year to clarify and explore the distinction between these two forms of pluralism. In doing so, I will hopefully not only further focus my efforts in productive ways but help my readers clarify their positions on this important topic. Forward into the future! I don’t know what it is today but I find it difficult to do anything but simple tasks. Ride the bike, build a fire and take a nap. Perhaps the fact that we are only three days away from a new year, the ending of one cycle and the beginning of a new weights on me. Perhaps like old man time I am feeling the effects of an eventful year. Perhaps the fact that in nine days I will be sending my oldest son, a young man of eighteen, off to the military and very likely war weights on me. Perhaps the fact that I spent part of the morning speaking to a youth concerned for a friend’s life or death struggles and I could, even with all my training, offer little advice or direction. Perhaps I need to let myself just experience, just feel, “just be” in the moment. 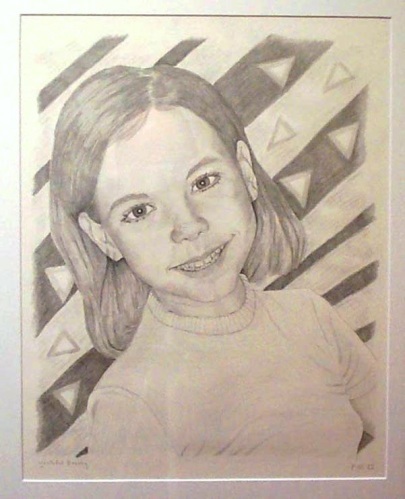 Drawing of a young teen! “Yap!” The girl exclaimed with a smile. “Probably nothing!” stated the girl with a quizzical look. “What is he like,” asked the stranger? His responsibilities, his meaningful life! I hope you enjoyed todays posting, a break from the usual fare. Tomorrow we return to the journey as we near several new pilgrimage sites!